Fifteen Draper Knitting Employees have 25 or more years working here. This is 469 years worth of experience! Our most senior members (46 years each) are Scott Draper, vice president, and Gary Butterworth, Dye House Supervisor. We call these 15 employees the “25+ Years Club” and celebrate them with a luncheon each spring. Congratulations and thank you for your continued service! 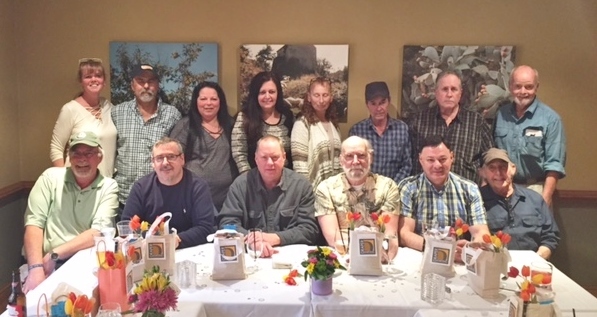 Back Row (with years in parenthesis): Kristin Draper (30), Tony Vieira (40), Cheryl Brown (25), Connie Kinsella (31), Patty Blais (25), Ben Fernandes (32), Gary Butterworth (46), Scott Draper (46) Front Row: Bill Shaul (28), Fernando Meneses (33), Ken Ronci (26), Bernie Berube (25), Lino Fortuna (25), Bob Costa (25), not pictured Joe Oliveira (32).